Click Here to take a virtual tour of this home! Stop your search here!! This is a 4 bedroom, 3 bath oceanfront beach house located on Waccamaw Drive in Garden City Beach! This newly rennovated beach house comfortably sleeps 14 guests with 2 king beds, 1 queen bed, 2 sets of triple bunk beds, and a sleeper sofa in the living area! The first floor of the home features a full-size kitchen and boasts endless views on the Atlantic Ocean. You can access your private ocean front porch on this level of the house. In addition, there is 1 bedroom with a full bath on the first floor. This bedroom consists of two, triple bunk beds! Behind the kitchen is the living room, and just around the corner are the stairs that will lead up to the second floor. On the second floor, you will find 3 bedrooms and 2 bathrooms. Two of the rooms feature king-size beds, and the 3rd bedroom offers a queen-sized bed. The washer and dryer is also located on this floor. There is brand new furniture (including flat screen tvs) in every room throughout the house! The kitchen is fully stocked with dishes, pots, pans, glasses, silverware and cooking utensils so you can pack light! **Cooking spices/oils and paper products are not provided. This home was renovated from floor to ceiling in January 2019, with brand new everything! New furniture, new flooring, new appliances, new decor, and so much more! After Dune Delight is an incredible rental for you and your crew! Each bedroom has it's own cable TV and linens/bedding are provided for each, including the sleeper sofa! Each bathroom will have 8 towels and 8 washcloths with very small starter toiletries to help get you started! As we make our way outside the home, you will notice ample parking under the house. There is plenty space to accommodate 4 vehicles. Feel free to bring your boat, trailer, motorcycles, jet skis, or all of the above! You'll also find a hot tub under the home that will comfortably seat 4-5 guests. 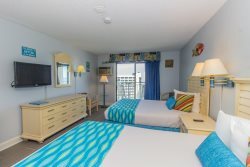 We are just 8 miles south of Myrtle beach and only .5 miles from the famous Garden City Pier! The Garden City Pier is 668 ft long and there's no fee to walk out on it! During the summer, there is live music from 8 pm-midnight! From midnight to 6 am, the pier is reserved for fishing only. Please note: hours of the pier are seasonal and subject to change. Directly across the street from the pier, is an arcade for games and excitement! Also on the pier, is Pieradise Cafe, which is serves breakfast, lunch and dinner during season! Other nearby food options are Sara J's Seafood Restaurant, Original Sam's Corner, Gulf Stream Cafe and Marlin Quay Marina! Just south of Garden City Beach is Murrell's Inlet which features Restaurant Row, which is considered to have the best seafood and barbecue in South Carolina! Murrell's Inlet is also known for fishing and some of the nation's best golf courses! This house is not handicap accessible and the only access for entrance is by stairs, as pictured. This home is truly a beach escape you will never forget!